Sarah Goffman, "I am with you" (2017). Courtesy of the artist. Photograph by Andrew Curtis. How are women represented in the media and what are the alternatives? Join panelists Nayuka Gorrie, a Kurnai/Gunai, Gunditjmara, Wiradjuri and Yorta Yorta woman who writes on Black politics, queerness and feminism; Brigid Delaney, journalist, author and features editor of Guardian Australia; and Natalie Thomas, artist, writer and fierce advocate for the participation of woman in the arts, for a compelling discussion of women’s place within contemporary media. This panel discussion marks the launch of a symposia series on feminist analyses and strategies in relation to the media, writing, new forms of publishing and text as form, unfolding as part of the Australian Centre for Contemporary Art’s summer exhibition Unfinished Business: Perspectives on art and feminism. 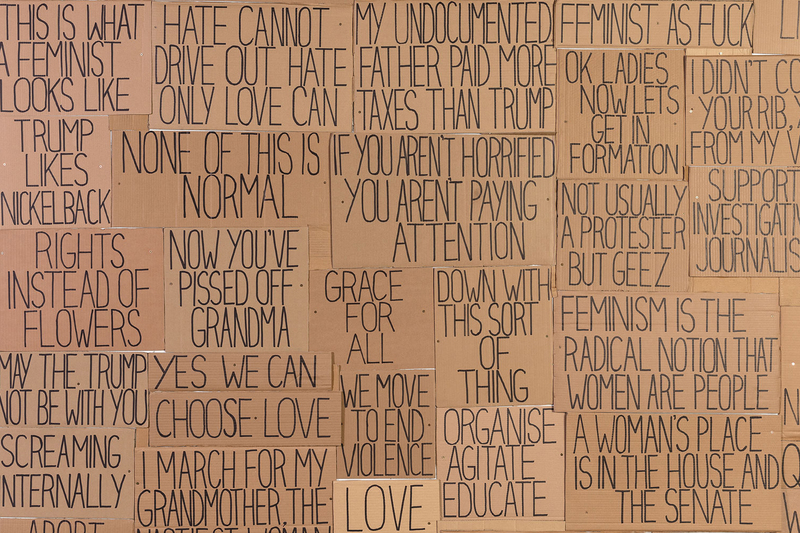 Surveying the diverse scope of feminist art practices, Unfinished Business focusses upon the dynamic formal invention and social engagement of feminist artists. Asking why feminism is still relevant, necessary and critical today, Unfinished Business explores trans-generational legacies, inheritances and shifts, alongside contemporary conditions and urgencies. For more information about Unfinished Business please visit the ACCA website. See you at MPavilion!